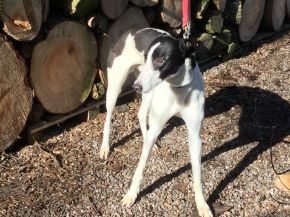 JOHN-BOY is mainly white with black markings and he was born in June 2016 so is still a youngster. He has a lovely, sweet face and a gentle nature and is microchipped. He is a loving and affectionate boy who just loves being cuddled. JOHN-BOY is currently on bed rest as he has an injured foot but will soon be starting short walks on his way to recovery. He is not fazed by people or dogs walking past his kennel and seems very accepting of his quiet life at the moment. He will make a super loving companion.